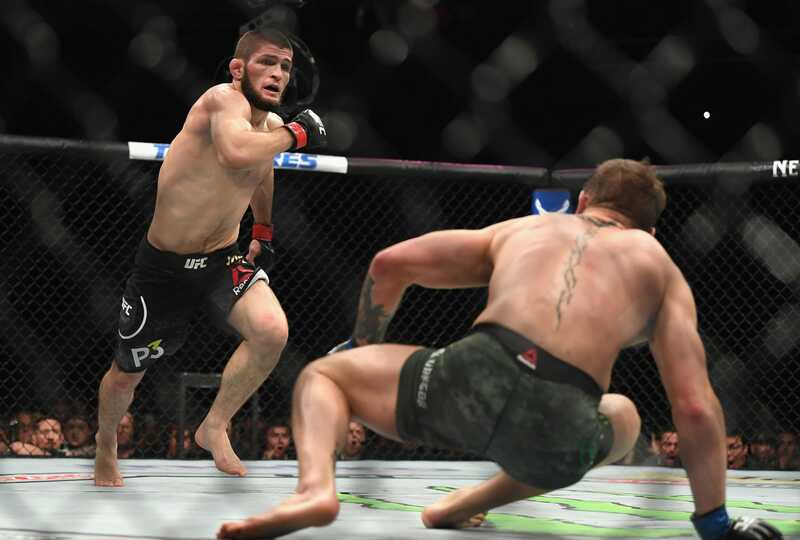 Photo by Harry How/Getty ImagesKhabib Nurmagomedov flattened Conor McGregor in the second round at UFC 229. Khabib Nurmagomedov got the biggest win of his career when he submitted Conor McGregor in four rounds at UFC 229. But there may be more to the comparison than a flawless combat sports record. Business Insider considers Nurmagomedov and Mayweather’s upbringings, how they take little damage in fights, and the impact they have on their sport. Nurmagomedov is three fights away from a 30-0 record, and there are three massive opponents out there who can help him secure a clear legacy at the pinnacle of the UFC. If he wins all of those fights, he could easily retire as the best lightweight the UFC has ever seen, an unbeaten beast, and the Mayweather of MMA. Maybe now, after Nurmagomedov destroyed McGregor in a dominant four-round victory at UFC 229, the comparison will be taken seriously. Nurmagomedov’s submission win over McGregor extended his extraordinary run to 27 wins from 27 fights – the most career wins without a single loss in mixed martial arts today, according to Fight Matrix. The Russian is cherishing his undefeated record and his unbeatable aura, just like Mayweather did when he collected 50 wins from 50 professional boxing fights from 1996 to 2017. But how similar are they? Well, both fighters certainly had unconventional upbringings. Mayweather learned to box as soon as he could walk, as a one-year-old boy punching the things he could reach like hanging plants and door knobs. Just before Mayweather Jr.’s second birthday, his father, Floyd Mayweather Sr., held him up by the ankles to act like a human shield, the last line of defence against an angry relative with a gun. The relative was Tony Sinclair, Mayweather Jr.’s uncle. Sinclair spared Jr. and aimed lower, firing his 20.gauge shotgun at Mayweather Sr.’s leg. It ate a hole in his calf, and effectively ended his career as an elite welterweight fighter in 1979. He recovered well enough to fight another day, but never at the same level as he was able to before. Mayweather wanted to escape a violent childhood, he dreamed of becoming one of the successful fighters he had pinned up on his bedroom walls as a kid, and it was boxing that allowed him to bring home the sort of money that his family never seemed to have. Mayweather’s two uncles, Roger and Jeff, and father, Floyd Sr., all fought at a national level or above, and passed their knowledge and expertise to a young and impressionable Jr. Boxing was always in his life and his blood. Perhaps it was always inevitable that Mayweather would grow up to see his name mentioned alongside the defensive greats of the game like the former four-weight world champion Pernell Whitaker, the Hall of Fame featherweight Willie Pep, and the greatest of all time Sugar Ray Robinson. The role models in Nurmagomedov’s family are similar, all you have to do is replace boxing with grappling. The Nurmagomedov men all had a passion for hand-to-hand combat. Nurmagomedov’s father, Abdulmanap Nurmagomedov, won national championships in judo, sambo, and freestyle wrestling, according to Bloody Elbow, and it was not long before he was able to share that passion and expertise with his son. When young Khabib was seven, Abdulmanap and his three uncles moved their families to a three-storey house in the Dagestan capital Makhachkala, according to ESPN. There were 16 boys under one roof but no women as they kept it “old school” and “like the military.” All the boys wrestled and trained in combat sambo. But it wasn’t just siblings and cousins Nurmagomedov would roll around with. At nine, he began wrestling bears. Like Mayweather in Michigan, violence could often have just been around the corner for a young Nurmagomedov on the streets of Makhachkala. “All guys are tough and everybody is ready to fight all the time,” he told ESPN in 2015. But, just like Mayweather, Nurmagomedov channeled his desire to fight into an arena that allowed it. Away from the streets, and into competition. For Mayweather, that began with amateur boxing, something that culminated with a bronze medal at the 1996 Olympic Games in Atlanta. For Nurmagomedov, it was wrestling drills at eight-years-old before national titles in sambo and judo. But it was a success in the exotic and foreign sport MMA that Nurmagomedov craved most. Mayweather was already 35-0 and a three-weight world champion when he fought Zab Judah, a fellow American who, like Mayweather, was considered brash and flash at the time. They met in Las Vegas for a 12-round welterweight title fight in 2006, which had the IBF and IBO championship belts on the line. At this point in his career, Mayweather had long established himself as the “Pretty Boy” of boxing. This is because he hardly took any damage and retained his youthful looks thanks to a Philly Shell defensive technique that allowed him to roll his shoulder and slip shots. He had an adaptive style where he could press forward for a stoppage like when he bloodied Arturo Gatti in 2005 or coast to a simple decision. Regardless of the route he chose, he had only really been tested once when he met José Luis Castillo for the first time in 2002. He beat Castillo easier in the rematch and would rarely be tested ever again. Against Judah, Mayweather came-from-behind to coast toward one of those decision wins. It would have been just another routine points win had it not been for Judah throwing a low blow with 10 seconds to go before the end of the 10th round. Judah followed the shot to the groin with an illegal punch to the back of the head. Mayweather, visibly in pain, doubled over in the ring. The fighter’s uncle, Roger Mayweather, then jumped through the ropes and confronted Judah. All hell broke loose when Judah’s people did the same to protect their guy. The ring ended up looking like the WWE’s annual Royal Rumble event – a feral free-for-all. The New York Times reported that over a dozen security and police officials were needed to restore order to the chaos. Boxing was given a black eye. If you can look beyond his puffy cauliflower ears, Nurmagomedov may well be the “Pretty Boy” of MMA. Like Mayweather, Nurmagomedov’s skillset is so enhanced he is rarely tested within the confines of his battleground – the octagon. Before he fought McGregor on October 6, Nurmagomedov had won every single round of every one of the 26 fights that he had competed in – and he did so while absorbing a minimal amount of damage. Again, just like Mayweather. He even had an adaptive style where he could secure a knockout, lock in a submission, or coast to a routine decision win. 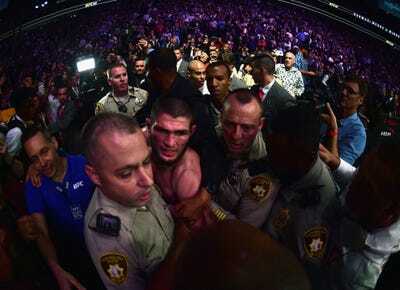 Unlike Mayweather, the ring riot that Nurmagomedov was involved in at the weekend was sparked by his action. You could argue it was a reaction to all the pre-fight trash-talk that McGregor had subjected him to in the six months leading up to fight night, but even after making McGregor tap with a tight neck crank in the fourth round of a wildly entertaining UFC 229 main event, Nurmagomedov refused to celebrate his greatest triumph. Instead, he jumped the octagon fence and charged at McGregor’s cageside friend Dillon Danis. While this was going on, a brawl erupted in the octagon, with McGregor and members of Nurmagomedov’s team exchanging punches. When Nurmagomedov finally returned to the cage and calm had been restored, the UFC boss Dana White could be heard telling the Russian that there was no way he could let him leave with the UFC lightweight championship belt wrapped around his waist as he feared what an angry Las Vegas crowd could do. Instead, Nurmagomedov was escorted out of the arena by the city’s police. MMA now had a black eye of their own. Photo by Harry How/Getty ImagesNurmagomedov escorted out of UFC 229 by police. There have been many incantations of Mayweather. From the “Pretty Boy,” to “Money,” and finally, “TBE” – which stands for “The Best Ever.” The acronym is braggadocio. There are fighters superior to Mayweather in the annals of history, and the nickname is just a riff on Muhammad Ali calling himself, “The Greatest.” But, regardless, Mayweather may well have earned the right to call himself TBE of a specific weight class. Mayweather had his biggest and most lucrative victories in and around the welterweight division (Manny Pacquiao in 2015 and McGregor in 2017 are the two best-selling pay-per-views in history), but his greatest work was through his reign as a super featherweight champion. After all, he is ranked the second-best ever champion at this weight by the WBC, and the best ever at this weight by Proboxing-fans.com and BoxingScene.com. Nurmagomedov is approaching this kind of pedigree. He is considered the second-best athlete in the entire stable of fighters that the UFC currently has to offer, regardless of weight classes. And, with a successful defence of his UFC lightweight title under his belt, a massive scalp in McGregor on his résumé, and an intriguing future ahead of him – the 30-year-old is realistically just three wins away from becoming the best 155-pound fighter the UFC has ever seen. “TBE” at lightweight. His path to TBE is already clear. Assuming the Nevada Athletic Commission follows the UFC boss Dana White’s advice and slaps Nurmagomedov with a $US250,000 fine and a six-month ban from competition for the role he played in the UFC 229 riot, he will still be the UFC lightweight world champion, and will, let’s presume, be allowed to compete in the United States. This means his 28th professional fight would likely be against Tony Ferguson. Ferguson is the fighter who survived the blood-and-guts brawl with Anthony Pettis. The UFC 229 undercard bout between Ferguson and Pettis was a brutal slobberknocker, and one Ferguson prevailed in by way of technical knockout in the second round. Ferguson has the record for most wins in UFC lightweight history, is on a killer run at the weight, and is bang in-form. 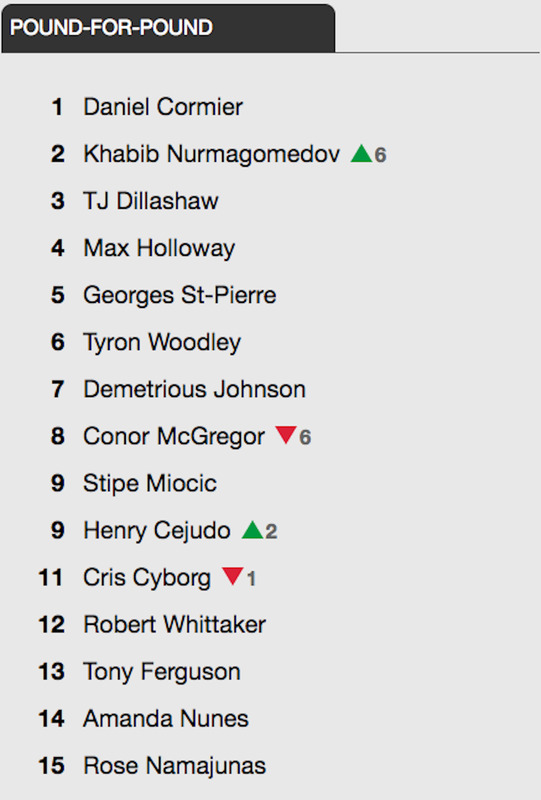 Ferguson even features on UFC’s top 15 pound-for-pound list (see above). A fight with Nurmagomedov would rank amongst the highest quality MMA you could ever see as it would pit Ferguson’s collegiate-level wrestling, jiu-jitsu black belt, and stingingly accurate strikes, against Nurmagomedov’s jab, thumping overhand right, and nasty ground-and-pound techniques. 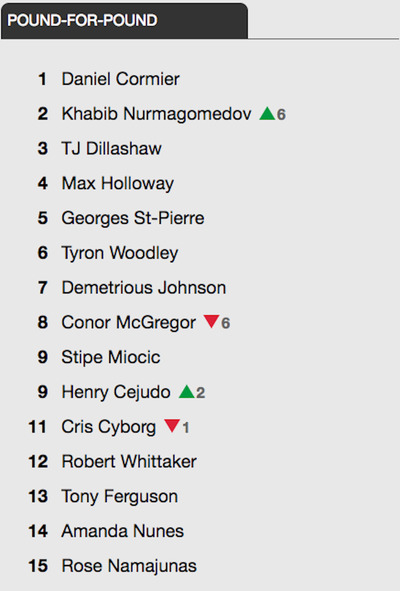 Should Nurmagomedov dispatch of Ferguson, he would have beaten four of the fighters currently ranked in UFC’s top ten list at lightweight, meaning he will have cleared out the most interesting, relevant, and competitive names in the division. 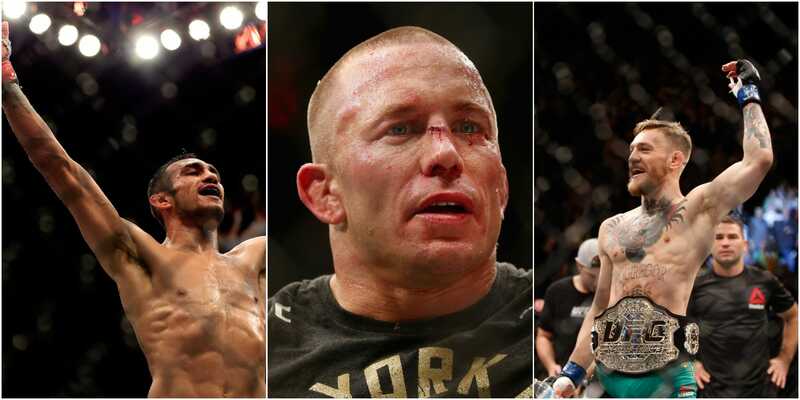 This could leave Nurmagomedov looking for a legacy fight – and there may be no legacy victory more definitive than one over fellow top-level wrestler Georges St. Pierre, the former two-weight world champion. St. Pierre is heralded as the best welterweight fighter ever, and the most accomplished mixed martial artist of all time, according to Fight Matrix. Along with Michael Bisping, St.Pierre holds the record for the most wins in UFC history (20) and came out of a four-year break to beat Bisping, the reigning UFC middleweight champion at the time, wrestling the belt away from the Englishman’s waist in convincing fashion in 2017. The gap between middleweight, where St.Pierre last fought, and lightweight, where Nurmagomedov currently campaigns, is vast. However, eagle-eyed fans noticed that St.Pierre had massively slimmed down in September, and looked like he was preparing his body to challenge the winner of UFC 229. As the winner is Nurmagomedov, St.Pierre may want to fight him at the Bell Centre in Montreal, Quebec, or even Las Vegas. Beating GSP would leave Nurmagomedov just one fight away from reaching 30-0, and there would be no better opponent to step-up than his old foe McGregor. A rematch in Dublin, Ireland, or St.Petersburg in Russia, would be huge, bringing together a rivalry that refuses to go away. If Nurmagomedov gets to the end of that gauntlet run of opponents and is still undefeated, then he will easily have become the best lightweight ever to grace the UFC, and at 30-0 will have backed-up his claim that he is, without question, the Mayweather of MMA. Who knows, maybe it is Mayweather who will have been the Nurmagomedov of boxing all along.